The designs for the ever popular M16 nearly ended up in the shredder. The evolution of this rifle (over the past 50 years) is a fascinating story, involving politics, strategies, and many errors. At first glance, the M16 may look to some like a toy. Its materials make it very lightweight, and due to its designs, there is little to no recoil. But make no mistake – this is a deadly and lethal tool, forged for war. The M16 is known as the “Vietnam gun”, but the idea of creating a lightweight machine gun is an idea that designers and weapons engineers have been toying with since the late 40’s. For a decade or so, this idea remained exactly that – an idea, nothing more. With the advent of the Korean War, the U.S. government was looking for a weapon which could replace the M1 Garand, which was the standard issue military rifle, as well as the M1 Carbine. The American infantrymen, fighting in Korea, needed more firepower than the M1 could provide. There was a growing demand and undeniable need for a better assault weapon, one which the U.S. troops could stand behind. The Chinese were also using older WWII weapons, but they had sheer numbers on their side. Many battles in Korea were close quarter combat (CQC) situations. This, perhaps more than anything, demonstrated the need for a new kind of weapon. One which could be operated in varying conditions, and which would give the U.S. an advantage against the larger numbers of the enemy. A trained soldier could fire 50 rounds a minute with the M1. This was not nearly enough, considering you were confronting hundreds and thousands of enemy troops who were running towards you. Out of this great need, the idea of the M16 was born. 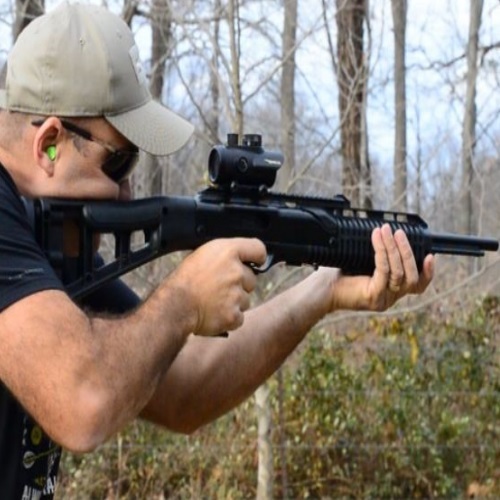 A lightweight assault rifle which could be operated easily, which could compensate for the lack of accuracy on the shooter’s part, and which would allow many more rounds per minute, and improve success at short-range battles. The idea of short-range combat was one which went against a firmly-held belief – bordering on myth – which was a part of the heritage of the U.S. Armed Forces. That belief was that long-range combat is the best way to win a war. One shot – one kill. This harks back to the days of the American Revolution when a claim that America won the war because of its sharpshooters was in heavy circulation. This idea stuck, and it was perpetuated during WWI with stories of American marksmen wiping out the enemy using heavy-caliber, long-range weapons. In 1950, during the Korean War, this idea/myth went under the microscope of the U.S. Army’s analysts and specialists. These individuals studied infantry operations and weapons usage in Korea, and they found that in most cases, an infantryman would hold his fire until the enemy was within 200 yards. In other words, it became clear that a long-range weapon was not as necessary as was thought. Something new needed to rise from the ashes of the M1, and that something was the M-14. The M-14 was very similar to the M-1, but it had a 20-round magazine. There was a great downside, though. Accuracy. It was very poor, when in full-automatic mode. Recoil was harsh, and follow-up shots were not proving to be as accurate as the first shot. Even in the hands of trained soldiers, full-auto mode was a problem. In semi-automatic mode, however, the M-14 was a definite improvement over the M1. 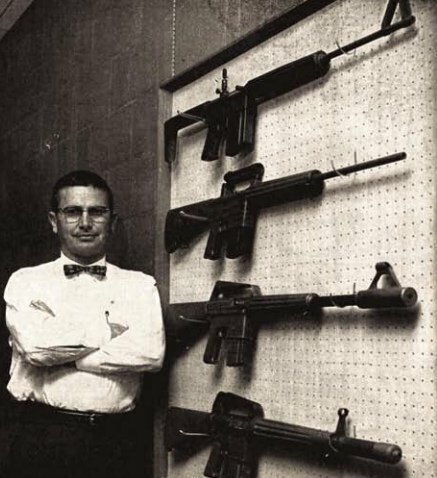 Eugene Stoner was the engineer, inventor, designer, and father of the modern-day M16. In the 1950’s, Stoner was chief engineer and designer at a company named “Armalite”, a division of Fairchild aircraft. He had the idea of using fiberglass, aluminum alloys, and the advanced and lightweight materials which were used in the aircraft industry to create a new kind of weapon. Stoner died in 1997, but his designs have revolutionized the world. The U.S. Army began to notice Stoner and Armalite when the AR-10 assault rifle grabbed their attention. It was incredibly lightweight (7 lb), it fired 7.62mm caliber rounds, it had a 20-round magazine, and it was a very versatile design. In spite of its many positive attributes, the Army chose not to develop it. Combined with the fact that the military saw no real problem with the M-14, it was decided the AR-10 was not the weapon for the military. In 1957, a four-star general named Wyman paid a visit to Armalite’s facilities in California. He told Stoner that he was interested in developing the AR series for the military, and Stoner went on to create the AR-15. 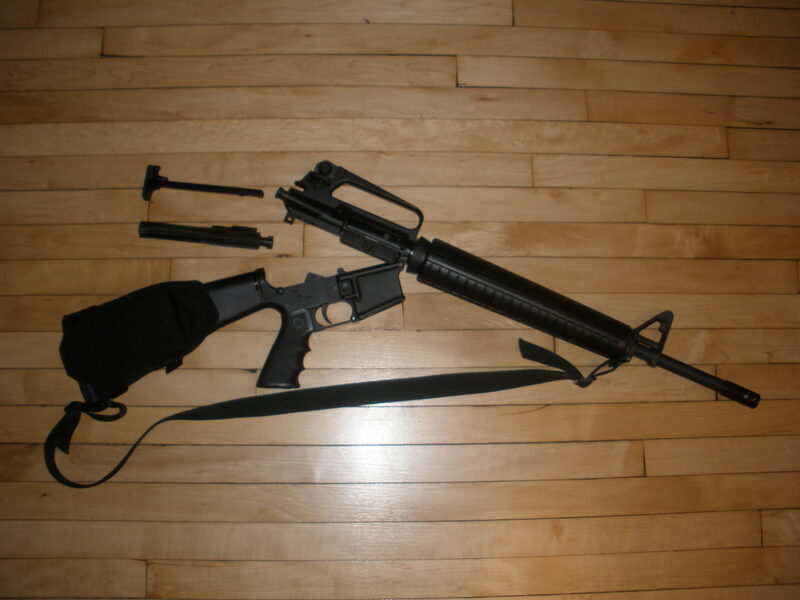 This was the earliest version of what later became the M16. The AR-15 was made primarily of fiberglass and aluminum. Only the barrel, along with a few other parts, were made of steel. This was a huge advantage, and it was one which was met with great enthusiasm. It had semi- or fully-automatic capabilities, and it could fire a 25-round magazine. The AR-15 was a marvel, and it was powered by a sophisticated gas system. It weighed just under 5 lb, had a bakelite grip and thin barrel, and a three-pronged flash-suppressor. The bakelite was a very light and fragile material, which could very easily be broken. It was a good weapon, but it was somewhat not reliable. The original AR-15 used smaller .22 caliber bullets, whose ballistic range was shorter and who were more susceptible to the interference of weather conditions. The army wanted something more soldier-like, which could withstand punishment, be it at the hand of the common infantryman or the elements. The AR-15 had one major advantage – weight. This was the game-changer. Soldiers could carry a lot more AR-15 ammunition than M-14 ammunition. Three times as much, actually. And this was one thing which the Army could not ignore. It was very clear, even back then, that the AR-15 had great potential. However, due to bureaucracy, politics, (and no small amount of ego), the AR-15 was passed on. This rifle had a very tough time getting the approval of the Army. It was thought that issuing lower caliber weapons would be a step back for the infantry, not forward. Plus, there were those who did not like the fact that the weapon was designed by an outsider. They wanted the U.S. troops to use in-house-designed weapons. In 1958, General Wyman – who had always believed in Stoner – gave the go-ahead for official tests to be conducted on the AR-15. Army officials were impressed with the performance of the AR-15, and they saw no major disadvantages. However, when further testing was done in the Arctic region, the AR-15 performed poorly. It was malfunctioning, inaccurate, and unreliable. Some claim that those 1958 arctic tests were fixed, in order for the AR-15 to be marked as a failure. When word of the poor performances reached Stoner, he flew to the testing grounds to witness and oversee the operations firsthand. What Stoner saw when he arrived was that his rifles had been tampered with. Certain pieces were taken off the weapons, and other, inferior pieces were put in their place. This caused parts to be misaligned and rendered the gun inoperable. The officers at the testing were somewhat hostile towards Stoner, and they did not want his design to be successful. Par for the course, some would say, as the Army had already shown how much they were not interested in Stoner’s new weapon. But, it wasn’t all ego and pride. There were other, more conservative, more realistic reasons for the Army being wary of the AR-15. The rifle which would be in line to replace the M-14 would have to be one which could protect its carrier. Army officials refused to believe that a small caliber weapon like the AR-15 would be sufficient, and they saw it not only as a flawed design but also as a liability and a danger to those who would be holding it. The last thing these generals wanted was a standard issue rifle which could potentially harm U.S. soldiers. The AR-15 received its share of praise and positive reinforcement from fellow engineers and designers, but after the 1958 tests were done, the Army had dropped all interest in the project. The official reported stated that the AR-15 did not have sufficient merit to be seriously considered as a standard issue infantry combat rifle. The Army didn’t want to develop the AR-15, but civilian company Colt bought the manufacturing rights from Armalite and began marketing the AR-15 around the world with an aggressive and enthusiastic campaign. Colt, based in Hartford, CT, knew what they were doing. They’ve had enough experience to know a good thing when they saw it. They marketed the AR-15 as both an assault rifle and a competition gun. One Air Force general, a man by the name of Curtis LeMay, attended a 4th of July picnic, hosted by the gun industry. A Colt representative set up targets and handed the General an AR-15. LeMay was so impressed with the weapon’s performance that he ordered 80,000 units right then and there. The general had been looking for a new rifle, and he thought the AR-15 would be perfect for defending Air Force bases. Congress, however, was skeptical, and they stopped the general’s order before it was put through. The move was not approved, because the country was not actively involved in any military confrontation. Several months later, in January of 1961, there was a change in the Oval Office. JFK got the keys to the White House, and he also got a growing problem which would later escalate into war – Vietnam. During Eisenhower’s administration, American advisors were in South Vietnam. They were there to advise and train the local soldiers. Colt’s AR-15 models were named Colt 601 and 602. These were basically duplicates of the original Armalite rifle, but they had flatter low receivers, without raised surfaces around the magazine well. 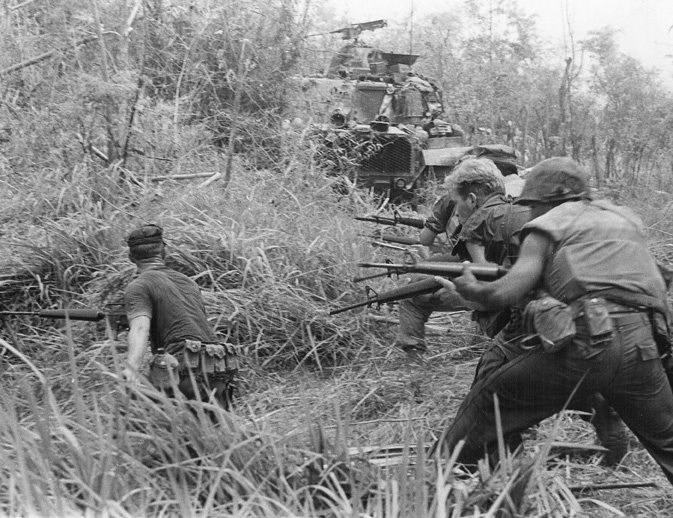 Gun runners were rampant as ever, and the Colt 601 and 602 had found their way to the hands of locals in South Vietnam. Finally, through some indirect channels, the AR-15 was seeing its first military use. A U.S. Army research operation bought about 1,000 units of the AR-15 and dispersed them across the military landscape. One of the groups who received a batch for research purposes was a battalion of Rangers operating in South Vietnam. The Rangers, who used the AR-15 under combat conditions, though it was a great weapon. Finally, this rifle was getting some real exposure. Little by little, The AR-15 became more known. The troops who used it immediately liked it. 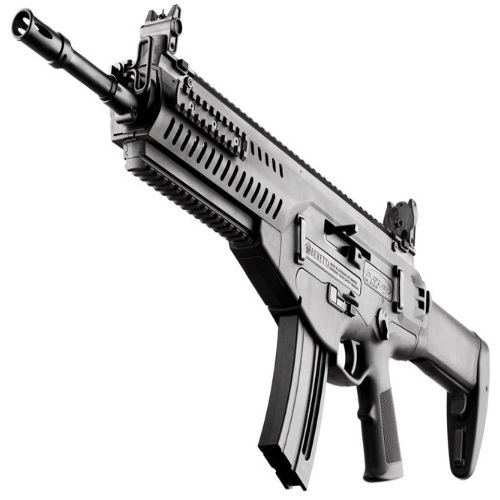 Its lightweight, its automatic-fire capabilities, and its accuracy made it ideal for combat in jungle/bush condition. The troops who were in Vietnam were praising the AR-15, and word of this assault rifle got to the newly-appointed Secretary of Defense, Robert McNamara. 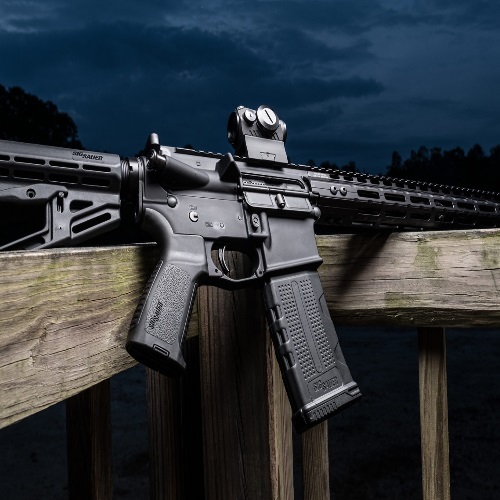 McNamara and his team saw great potential for mass-production in the AR-15, and after learning of the rifle’s history with the U.S. Army and its committees decided to make a move. McNamara ordered the military officials to begin distributing the AR-15 to the troops, and High Command had no choice but to adhere. The higher-ups at the Army, Air Force, and Marines were told to cooperate with McNamara and his team. The military was asked to make the AR-15 combat-ready as soon as possible. However, the military’s weapons development program clashed with the desires of McNamara and the defense community which he represented. McNamara’s team (dubbed the Wiz Kids) had veto privileges, and they had the power to make all final decisions, often overruling the military officials in the process. The AR-15 was renamed the M16, and in its official military incarnation, several changes were made. First, because the military used ball powder, as opposed to stick powder, the cartridges used for the M16 had a bit more of a kick. This gave them the ability to reach even longer ranges, and as we know, the Army loves those long-range capabilities. Second, there was now a left and right-hand grip. Another new feature was the appearance of a three-pronged flash suppressor, as well as a thicker barrel. While the M16 was being developed and tested in the United States, the situation in Vietnam was escalating. It was 1962, and the number of American military advisors in South Vietnam had shot up from 700 to 12,000. It seemed like another war was just around the corner. In 1963, North Vietnam was acquiring more and more territory, and there was civil unrest, protests, and demonstrations. Buddhist priests were burning themselves alive. And the number of U.S. Military advisors reached 15,000. In October of 1963, there was a coup. The president of South Vietnam was assassinated, just three weeks before JFK was assassinated. 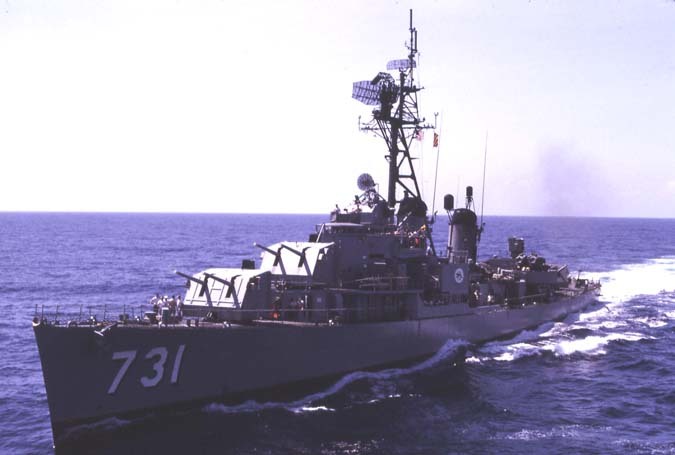 In the summer of 1964, North Vietnamese boats engaged an American destroyer by the name of USS Maddox. In March 1965, the first batch of combat troops was headed into the jungles of Vietnam. More troops were on their way, and the need for a new kind of standard issue assault rifle was becoming more and more apparent. The M16 was about to go to war. At the end of 1965, there were nearly half a million U.S. troops in Vietnam, and M16s were constantly being produced. One year later, the M16 became the standard issue rifle of the U.S. Army. Check out our Glock 17, 19, and 30 Features. After several months of use, there were reports of malfunctions. The rifles were jamming, the troops were not happy with the performance of the M16. Combined with the fact that many of the troops were not sufficiently trained in operating the weapon, the M16 was turning out to be a problem. Furthermore, the Army didn’t even bother to issue cleaning kits to the soldiers, claiming the M16 to be the world’s only self-cleaning gun. The result of the Army’s policy was a veritable mess. Soldiers would fire and make their weapons very dirty. Later, the weapon would malfunction due to the build-up of grime and dirt. After a Missouri Senator launched a full-scale investigation, it was found that the change in gunpowder was one of the main causes of jams in the M16. Another big problem was that the chamber was not chrome plated. This caused serious problems and was one of the most common reasons for an M16 to jam. Coating a rifle’s chamber with chrome was a well-known technique for rust and corrosion prevention. It was McNamara’s Wiz Kids who had vetoed the idea of a chrome-plated chamber when it was proposed by the Army. Their assumption was that if a chrome-plated chamber was essential, Stoner would have made that part of the original design. There was a lot of finger pointing going around. The Army blaming McNamara’s team, and vice versa. Essentially, McNamara himself was not to blame. He had ordered the Army to get this weapon ready for battle, and they did not execute that order properly. The M16 was clearly not combat-ready yet. The Army began issuing cleaning kits on the double, as well as fitting M16s with chrome-plated chambers. Within 12 months, the number of malfunctions had significantly diminished. Those who arrived to fight in the jungles of Vietnam from 1967 and on had very few problems with M16. As long as a soldier kept his gun clean and maintained, there was very little cause for it to jam. When America left Vietnam in the 70’s, the M16 was already known all over the world as a reliable, tested, combat-proven assault rifle. The United States still uses the M16 (or some variant thereof), and it is a symbol and a staple of the American Armed Forces. 1967 – 1969: XM16E1. 20 round magazine. Forward assist button. Chrome-plated bolt carrier. Firepower: Safe-Semi-Auto. 1968 – 1979: M16A1. 20/30 round magazine. Raised rib around the magazine release lever. A change of forward receiver pins. Firepower: Safe-Semi-Auto. 1980 – Present: M16A2. 30 round magazine. Thicker barrel. Brass deflector. Adjustable rear sight. Firepower: Safe-Semi-Burst / Safe-Semi-Burst-Auto. 1980 – Present: M16A3. Essentially, a full-auto variant of the A2 which was issued by the U.S. Navy to SEALs and SeaBees. It has the A1 trigger group of Safe-Semi-Auto. This model is currently still in limited service. 1997 – Present: M16A4. Very similar to the A2, but equipped with a MIL-STD-1913 rail. This rail can be fitted with sights, optics, or a carry handle. Firepower: Safe-Semi-Burst. It is a standard issue for the Marine Corps recruits, and the military A4s are also equipped with an M5 RAS handguard, by Knight’s Armament Company. This allows for all sorts of grips, lasers, lights, and other accessories to be added and attached. The M16A4 is being phased out in favor of the M16A2 variant M4. The classic M16 has many variants, and one of the most popular ones is the M4. The M4 rifle is essentially a shortened and lighter version of the M16A2. It is quickly becoming the United States Army and the United States Marine Crops’ go-to infantry weapon. Designed and produced in 1994, this A2 variant is capable of firing semi-automatic and bursts. 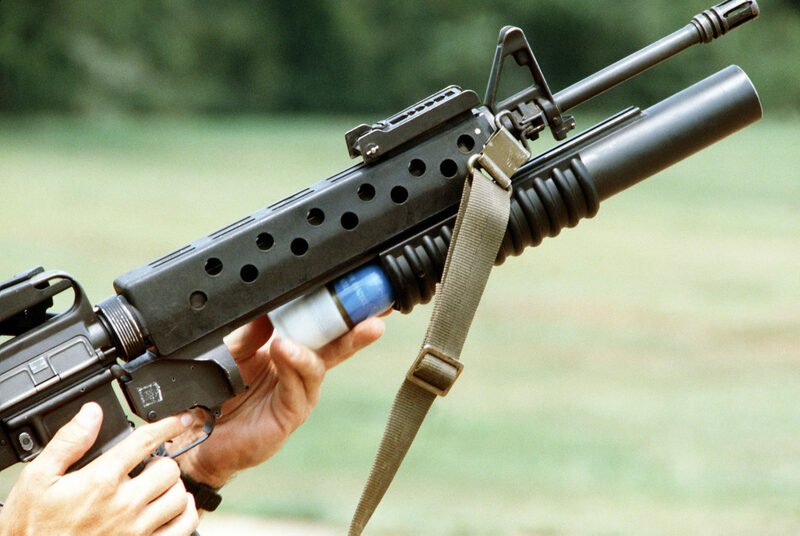 It can be used in conjunction with the M203 grenade launcher. The Army took ownership of the design of the M4 in 2009 and has improved the M4 a great deal. The new and improved M4, named M4A1, is designated to replace the M16 in all U.S. Armed Forces. It is operated by a shorter carbine gas system, rather than direct impingement. The M4A1 is almost identical to the M4, but the differences are crucial. The M4A1 is the fully-automatic variant of the M4 and has a Safe-Semi-Auto trigger group. This rifle was issued to forces such as Marine Corp Recon, Army Rangers, Army Special Forces, Navy SEALs, Air Force Para-rescue, and Air Force Combat Control Teams. It is a favorite of these units due to its versatility and high-performance in urban warfare and close quarter combat. The United States Army began converting all M4 to M4A1 in 2014. The conversion included a heavier barrel, a consistent trigger pull resulting in better accuracy, and ambidextrous fire selector. The Army is scheduled to be done with all M4A1 conversions by 2019. Mark 18 CQBR – an M4A1 with 10.3-inch barrel upper receiver. Enhanced M4 – suppression-ready barrel, articulating link piston. M4 Commando – 11.5 barrel, 3 separate models representing 3 trigger groups. Mattis stated that the military has been working on developing a more lethal round for the M16 and the M4. While this would be helpful, the truth is that the M16 is in need of a full-scale upgrade, and just a more lethal round will not cut it. United States’ military rivals in Russia began issuing their newest service rifle, the AK-12, in 2014. The latest version of the M16, the M16A4, was introduced in 1990, and replacement of the M16 with the M4 has not been carried out to any large extent. The M16 was a great gun for its time, but the United States needs to re-introduced the M16 to the gun world with a full upgrade – or risk falling farther behind adversaries. Although the M16 goes back over 50 years, the iconic American weapon is still making headlines in 2018. In April, the U.S. Army surprised the world when they announced they were looking to buy thousands of new M16s, up to 430,000, in fact. This decision had heads turning especially considering their well-known plan to phase out the M16 platform and focus more on the M4. However, the Army’s announcement was clarified that they’re not looking to supply our American troops. Rather, the government is actually just in the market to sell these rifles to foreign militaries. Without getting into too much detail, the AR-15 is essentially the civilian variant of the M16, which was initially developed for military use. Furthermore, the M16 is typically automatic and has a farther effective firing range. Even after all these years, the M16 still manages to stand out as a unique design which serves its purpose. About 8 million units of the Colt-produced M16 were sold since its inception, and it is still one of the most popular weapons in the entire world. Civilians, military, police, government agencies, and other organization use the M16 on a regular basis, and it is a standard by which many other assault rifles are measured. I carried M16A1 from Oct 1966 to Oct 1967 with 2/28 Bn 1st Inf division. I had trained with the M14 and found it very reliable. You could find 22, 25autos 38,357, and others being carried as back ups. we had three upgrades and told not to use federal brass as it was too soft. We taped cleaning rods to the side of our rifles in case of a jam. I still shoot AR’s but wood not bet my life on them. I have a Mini 14, M1A for that. Being old fashioned I prefer the M1A or M14, if I had the dollars to feed the M14 to maintain proficiency in full auto. I carried the M16A2 in Viet Nam, found it OK, but when I changed to the M14 as Designated Marksman I vowed never to go back. The AR-15 in 6.5 Grendel is my choice for a defense gun. I find the increased range and downrange ballistics far superior to the .223 / 5.56mm round (.224 caliber, actually). Were I not filled with arthritis I’d opt for the AR-10 in 6.5mm Creedmoor. I’d actually love to see the military go to the 6.5mm Grendel for its primary round as it outperforms everything under .338. Speaking of accuracy, the M-1 suffered two problems, a problematic gas system that needed retuning to a better bullet. The 150gr. flat-based “ball” bullet was too short and suffered a cross-sectional density problem. However, it also fit the .30-cal machine gun, M-1 and the M1912 BAR. Better loads exist for the .30-06 or 7.62x63mm M-1.